A: Your panes will be polished by a team of licensed and background-checked window cleaning adepts. Q: What services does window cleaning Thamesmead offer? A: The professionals will achieve exterior window cleaning with the help of the latest water-fed pole equipment on the market. For properties above the fourth floor, we'll dispatch practiced abseilers for rope access window cleaning. For inside pane polish, the team will resort to standard ladders and sponges. A: A few of raindrops won't disrupt the Thamesmead window cleaners' work – rainwater is usually mud-free. However, if we face a rainstorm, then we will kindly ask you to suspend your booking for another day. A: As long as the team can pass through your front gate, they can blast away all muddy streaks without you having to be close by. If your panes need a thorough in-house polish as well, then we'll arrange a quick key pick-up and delivery service. A: Usually, the distilled water tank inside the team's cleaning van is always full. In case the tank is empty and with your permission, the technicians can easily link the water-fed pole to any unoccupied water source. A: Once we inform you that the team's on their way, you'll need to ensure that they can enter your property unimpeded. In addition, the cleaners will need a parking space within 30 metres from your property and on the same side of the casements you want treated. A: If the team is nowhere to be seen because of serious traffic, we will notify you about the hold-up and call you as soon as they arrive. After going through lots of client feedback, we've changed our window cleaning Thamesmead's fees. Now, you can hire our service at prices that are nothing short of reasonable! For further information, please take a look at our price table below. Regardless of where your streaks have taken shelter, our resourceful window cleaning in Thamesmead will fight them off with ease. We have included several cleaning methods. 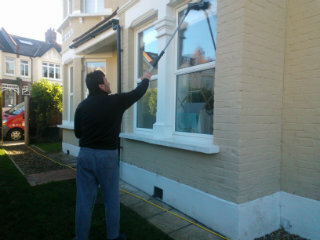 Our outside window polish is aimed at properties with no more than four storeys. To let the daylight back inside, the window cleaners in Thamesmead will appear in a caravan, supplied with a stretchable water-fed pole. This gear is attached to a water storage, filled with purified water. After being ejected as a powerful stream from the pole's brush-head modification, the liquid will absorb all blemishes in an attempt to regain its natural structure. To access muddy window corners of lofty buildings, we'll send a proven team for rope access window washing. These approved abseilers will utilize well-maintained ropes and harnesses or set up ladders and cherry pickers to restore the allure of your panes. We've got all essential COSHH records in place and follow every safety requirement. To make the in-house side of your window façade just as shiny, the technicians will depend on the usual ladder and squeegee washing method. Over time, we've answered the washing calls of customers from many adjacent regions. As a direct result, we broadened window cleaning Thamesmead's horizon and you can now witness our washing vans in the areas below. Another quick and easy way to get a free instant quote or to book window cleaning services Thamesmead SE28 is through our web site.